LUCIAN BUTE: "I'D BE HAPPY AND PRIVILEGED TO STOP GLEN JOHNSON"
With a shot at the biggest fight in Super Middleweight history on the line, undefeated superstar and International Boxing Federation (IBF) Super Middleweight Champion Lucian Bute will make the ninth defense of his 168-pound title against ageless former light heavyweight champion Glen "The Road Warrior'' Johnson on Saturday, Nov. 5, live on SHOWTIME® (9 p.m. ET/PT, delayed on the West Coast). The largest box office draw in Canadian boxing, the undefeated, Romanian-born Bute will enter the ring at Pepsi Coliseum in Quebec with an unblemished record of 29-0 with 24 KOs. Bute has registered knockouts in seven of his eight title defenses and has only gone the distance five times in his professional career. Johnson (51-15-2, 35 KOs), a legend for his bouts against Roy Jones Jr., Bernard Hopkins and Antonio Tarver, will make his 10th appearance in a world title fight. The 42-year-old Jamaican-born Johnson has fought out of Miami for almost two decades. The former world champ, who earned the nickname "The Road Warrior" for never shying away from challenging an opponent in his home turf, will once again travel to enemy territory for a shot at a championship. The winner of Bute-Johnson could likely meet the winner of the Super Six World Boxing Classic, which concludes on Saturday, Dec. 17, on SHOWTIME. World champions Andre Ward (World Boxing Association) and Carl Froch (World Boxing Council) will clash in the Super Six Final in a showdown that will determine the world's best 168-pound fighter. 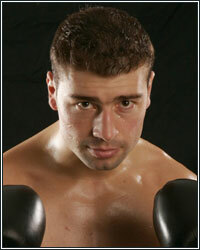 LUCIAN BUTE: "We're getting ready for a big fight. The fight will take place in Quebec City. As you know, I've been in camp for seven weeks with one week left to go this week. I have a good feeling  it's like I'm getting involved in the Super Six. I feel that kind of feelings right now getting involved in a fight with Glen Johnson, who has so much credibility that I'm kind of finally part of the Super Six. Glen Johnson has seen everything in boxing. He has tremendous experience and I know him as a friend. But I am also getting ready for my fight. I'm very confident, I've been working hard as usual and I'm confident on Nov. 5 I'll give a great performance." GLEN JOHNSON: "It's going to be a tremendous fight  I'm looking forward to it. It's going to be very exciting." Lucian, what are your feelings that Mikkel Kessler and Kelly Pavlik declined to fight you? BUTE: "As you know, we made several offers. I don't know why they turned it down. It's hard for me to say why. What I know is I have no control on their decision. Unfortunately, they would have been great fights, but at the end of the day I'm very happy that we ended up with Glen Johnson. I believe that he will make things very interesting." Lucian, what was it like to spar with Glen Johnson? BUTE: "It was two years ago that both of us were preparing for our respective fights. He was getting ready for Chad Dawson; I was getting ready for Librado Andrade. We know that sparring is always different than a real fight. He's been training hard the last few years and I've been doing the same on my side. "I think from the two of us I gained the most in that sparring. I came there and built my confidence. It was hard sparring, we wanted to win every day. It was competitive, it was great and I think I improved and proved my confidence after sparring with Glen Johnson." Glen, what were your thoughts on sparring with Lucian Bute? JOHNSON: "I don't know how many rounds we sparred, but I think it was around 96. "It was great work. Both of us accomplished our goal. We were doing hard work and I believe both of us got better. Obviously, I was fighting a better guy than Lucian was fighting. I came out on the losing side and he came out on the winning side. It is what it is, and we move forward from there." Can you each compare the step-up that each of you offers each other? Lucian, how does Glen compare to your opponents? BUTE: "Glen Johnson has seen almost everything in boxing. He's always there and he's always in great condition. He's faced all the great boxers  Jones, Tarver, Dawson twice, he even fought Hopkins in the beginning and he looked good even if he lost it. I can say by far that he is the best opponent with the best credibility. His resume speaks for itself, so for me it's a major step up." Glen, how does he compare to your opponents? JOHNSON: "He's a great fighter. He has a lot of talents, a lot of skills. He shows a lot of guts in his fights. He has fast hands, he's strong. He ranks amongst the best guys, but this is not sparring, this is fighting. It's a whole different level of fighting." Will you have any problem fighting a friend like Lucian after all of the time you've spent with him? JOHNSON: "I have a lot of respect for Lucian, but you're fighting for your career, you're fighting for everything here. I'm going to go out there and give it my all and resume our friendship later. But I've got to go out there and do what I need to do to win the fight." BUTE: "Exactly like Glen just said. We've got mutual respect for each other, also our team respects his team. I really cheered for him when he fought Allan Green and also when he fought Carl Froch. But with this my career is on the line. It has nothing to do with respect or the friendship. If I have to fight I'm going to give it my all. There are no friends in the ring; we're going to be friends after the bout. They can't take away what I've been working for." Lucian, did you do anything different for Glen Johnson as compared to your other fights? BUTE: "Every camp is a camp to become a better fighter. I work very hard and I know what's on the table. I know Glen is working very hard. I know he has a strategy and we'll have a great fight on Nov. 5." How would you describe Glen Johnson? BUTE: "With Glen Johnson, what you have in front of you is what you get. He's an aggressive fighter, he sets everything up with a nice jab, he's got a really dangerous right hand and he likes to put on the pressure. He wears his opponent down and if he puts that pressure on me all night it's going to be a long night. If I pick my moments here and there with the angles I think I can have a great evening." Glen, what is your philosophy on retirement and what do you expect out of yourself in this fight? JOHNSON: "I have plans on going on and moving forward. I feel great. I look to putting on a tremendous performance. I expect to come out of the fight victorious. For me, it doesn't have anything to do with age. I feel great and I'm just looking forward to putting on a great fight." Do you have any trouble making 168 pounds? JOHNSON: "I have no problems making the weight. The weight is not an issue. We've made the weight the same way when we came to this class. We've made it fairly easy and it's getting easier each time so weight is not an issue." Lucian, obviously your opponent has quite the record. What would it mean to you to stop Glen Johnson or are you just looking to go 12 rounds and get the win? BUTE: "As a fighter I'm going to bring it to the ring and I want to win as many rounds as possible to get the win and to keep my belt. If there is an opportunity, like any fight I'm going to jump on it. I'd be happy and privileged to stop Glen Johnson, but I don't think about that approaching the fight. I'm just going to go there and do what I always do and do it the best way I can to give a great performance." Lucian, what does Glen Johnson bring to the table? BUTE: "He's got credibility. He's been with all the best guys in the world so nobody can say anything about Glen Johnson. Nobody can blame him about being an opponent  he's been with the best guys and he's been beating almost everybody. That's what he represents for me." Do you believe beating Glen Johnson would finally make you considered one of the best fighters in the world? BUTE: "I've been looking to fight everybody. I want to fight anybody. I was always looking to fight the best fighters in the world. If they're not available then this is not my problem." Glen, how will you fight Lucian? JOHNSON: "I got my game plan and I just have to be smart about what I'm doing. If you watch on Nov. 5 on SHOWTIME you'll see exactly what I need to do." Are you concerned about his uppercut? JOHNSON: "When you go in the ring you've got to be concerned about anything your opponent does well. I've got to prepare for that particular style and take care of business." If you win, how long do you expect to stay at super middleweight? BUTE: "There are lots of fights available to me at 168 and I've got some good business in that category." How do each of you view the Andre Ward-Carl Froch Super Six Final? JOHNSON: "It's a close fight. I will have to go with the American because the fight is in America and I would assume that he would get the benefit of the doubt." BUTE: "I think it's going to be a nice, spectacular fight. I think it's going to be a close fight. The question is how Andre Ward will cope with the strength and the power of Carl Froch. If he's able to handle it, I think he's got the ability and the boxing movement and I'd go with him. But, let's see first how he will react when he gets hit by Carl Froch." Glen, how you access your performance against Froch? JOHNSON: "Poorly. I was very disappointed in what I was doing. It was a close fight and it was an exciting fight and I know I have plenty more in me than what I showed him." Lucian, how would you describe fighting in your homeland in Romania and your adopted home of Canada? BUTE: "Everybody knows I call my home Montreal and Quebec City. I feel comfortable fighting here. It was a privilege for me to fight in Romania. I took it as a privilege  a great experience." Lucian, do you feel any pressure to put on a better performance against Johnson than Froch? BUTE: "I don't feel any pressure trying to do better than Carl Froch. I have my own style and he has his style. That was their fight and this is my fight. I'm going to fight it the way I'm going to fight it and I don't give myself any additional pressure to do better than him." How do you respond to some people saying this is the toughest opponent you ever faced while at the same time saying it's a potential mismatch? BUTE: "We sparred together but I know one thing  this fight is going to be hard. It's not a mismatch at all. It's going to be a hard, tough fight." Lucian, do you think you match up better with Andre Ward or Carl Froch? BUTE: "I think I could challenge both fighters, but if you ask me about my style I would love to face Carl Froch." Glen, in the past few years you've been in with the top 168 and 175 pound fighters in the world. Do you want to go in there and really compete with Lucian or really beat him? JOHNSON: "We're in it to win it. We're not about just competing. We're in it to win it." Do you see any weaknesses in Bute? JOHNSON: "Bute has some weaknesses, we recognize them and we have our game plan and strategy to deal with those things. I'm not going to say any of those things, but if you watch Nov. 5 on SHOWTIME you'll see for yourself." Who do you think you match up better with Andre Ward or Carl Froch? JOHNSON: "I would prefer to fight Froch because I want to avenge my loss. But I think they're both great fighters and being in the super middleweight division for me is fighting the best fighters." For information on SHOWTIME Sports Programming, exclusive behind-the-scenes video and photo galleries, complete telecast information and more, please go to the SHOWTIME Sports website at http://www.sho.com/sports.